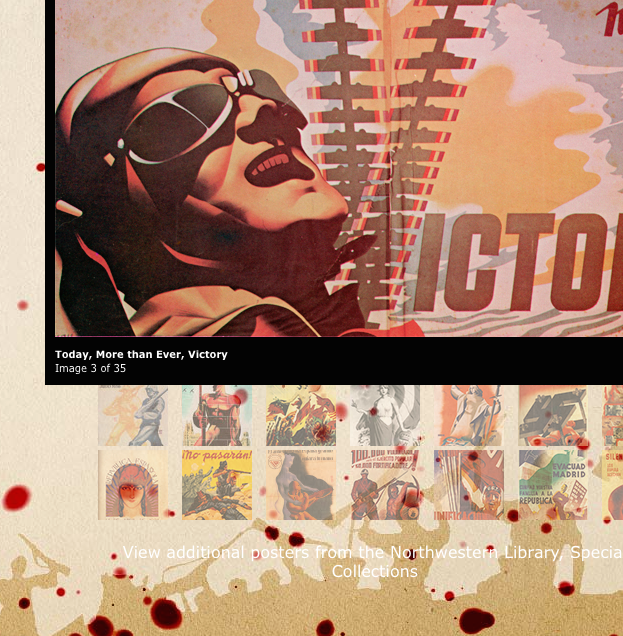 To supplement curriculum related to the Spanish Civil War, Penny Nichols of the Department of Spanish and Portuguese often incorporates visual imagery into classroom study, including historical photographs and propoganda posters. However, she had found the best images to be difficult to access or difficult to disseminate, requiring either a visit to the NU Library Special Collections or poor quality photocopies. To bring the wealth of imagery found in Northwestern’s libraries to students in the class in a new way, the MMLC organized a website of high-quality annotated visual materials. At the same time, NU Library Digital Collections sponsored an ambitious effort to digitally capture over twenty period posters housed the University’s special collections at a pristine resolution. During Phase I (2008), MMLC Summer Intern Aaron Meninga worked to design a visual container for the imagery that is both easily accessible and artistically compelling. During Phase II (2011), MMLC Summer Intern Katie Reifurth worked together with Penny Nichols to vastly expand the site’s content.